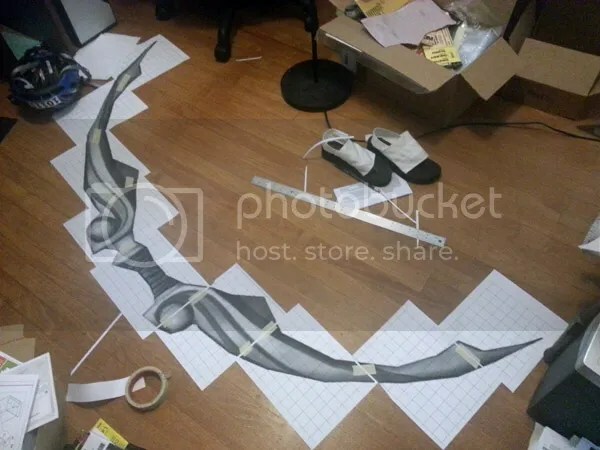 A few years ago I was commissioned to make a bow for a DotA 2 Windrunner cosplay. Fortunately I had access to both orthographic projections and a 3D model viewer, which were both incredibly helpful. Here I laid the images on a 1″ grid for reference. 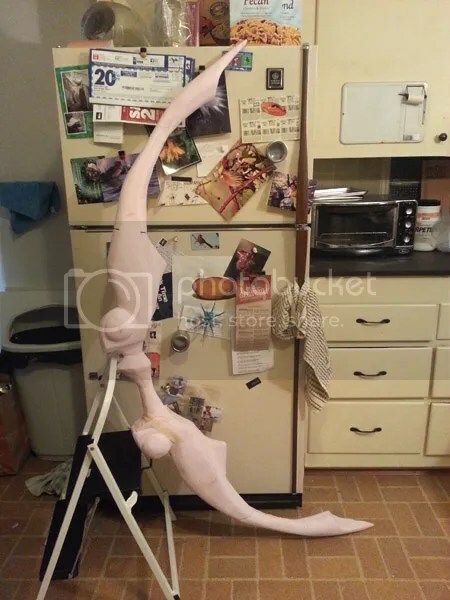 The bow will be 5’7″ when it’s done, scaled to fit my client. I printed out the side view at actual size. It’s good to have such a highly-detailed a full-size reference but as you can imagine it is fragile. I traced this image onto a piece of cardboard and used the cardboard silhouette as a guide when cutting out pieces. 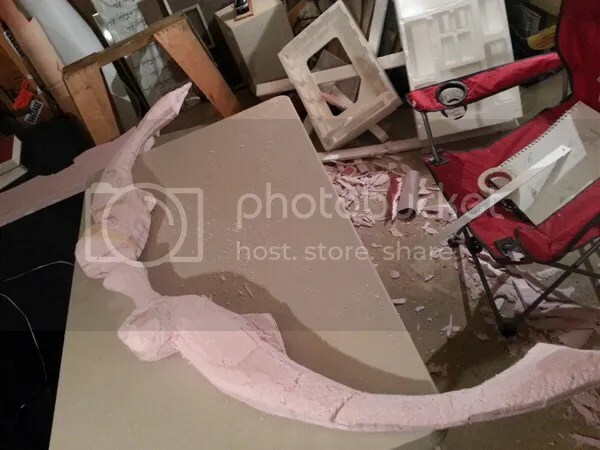 I roughly cut two bow shapes out of insulation foam. 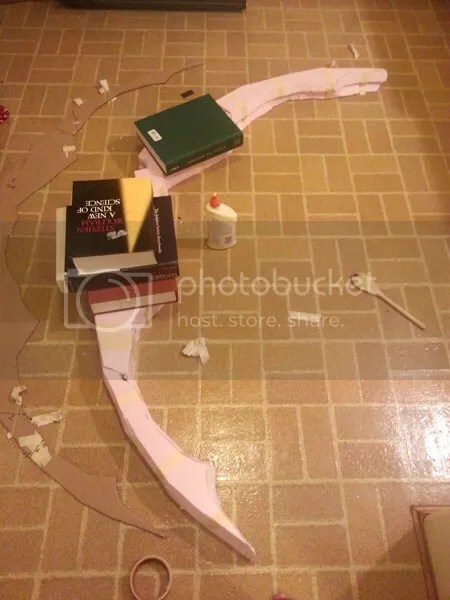 Here I cut a hollow indentation through the middle of the first slice and wedged a wooden dowel in there for strength and filled the gaps with wood glue. 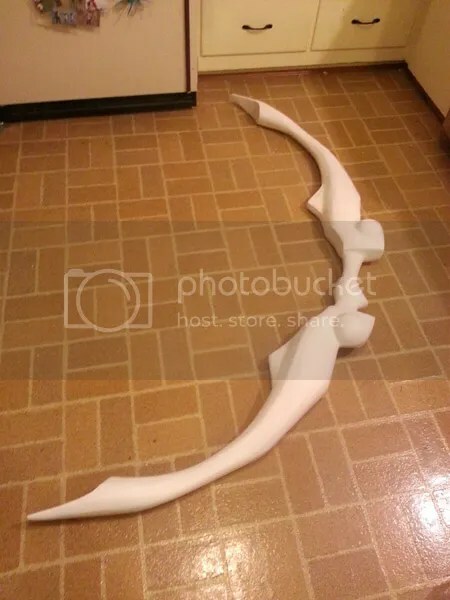 Each slice of foam is 1.5″ wide and in the thickest part the bow is about 4.5″ so in places I needed a thickness of three sheets. 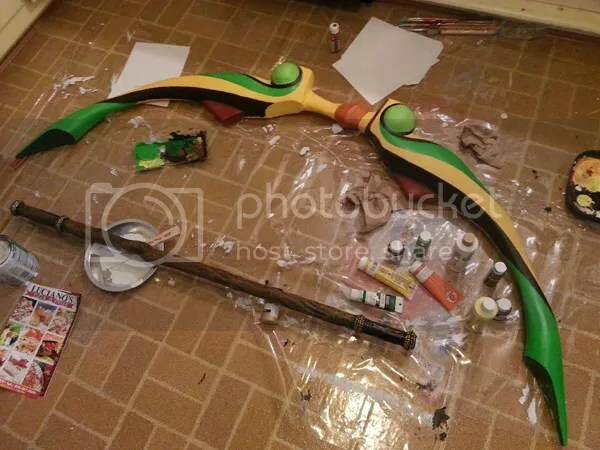 I glued extra slices on with wood glue and lashed the pieces together with masking tape until they were good and dry. Most of the carving was done with a cheap serrated steak knife. The fine serrations and narrow blade make it a very dextrous tool for this purpose. 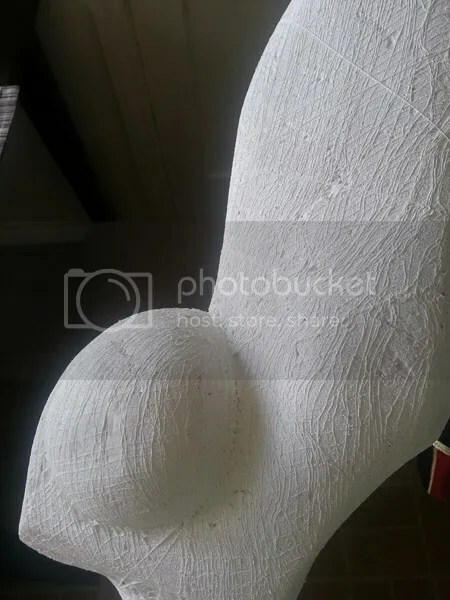 I carved and sanded it until it was very smooth. At this point the total weight was 12 oz. Here I wrapped it with cheesecloth and slathered it with gesso. The cheesecloth will give strength to the hard outer shell. 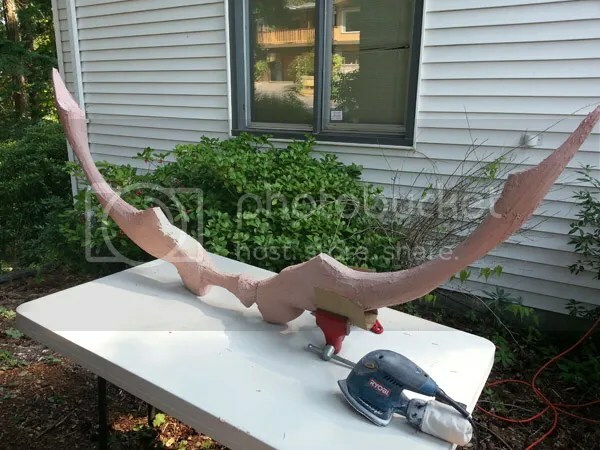 I coated everything with layers of Bondo then sanded it smooth. 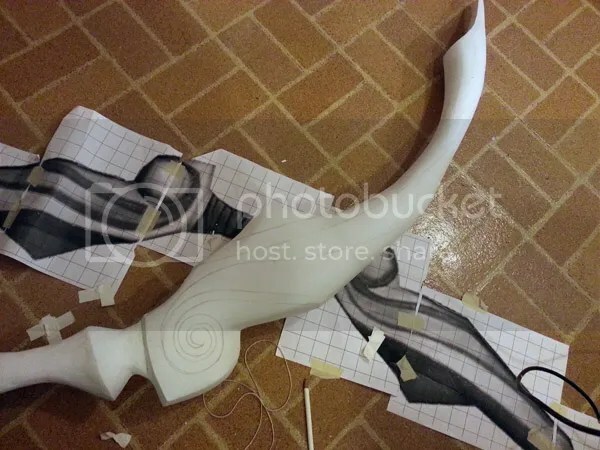 This is a very tedious process but the end result is a hard, strong shell. I coated it with an indoor/outdoor latex paint that won’t crack when this monster inevitably gets knocked or jabbed by something. I traced the patterns on with pencil. The guide really comes in handy for this because I could use a ruler to make sure all the patterns are the right size and shape. 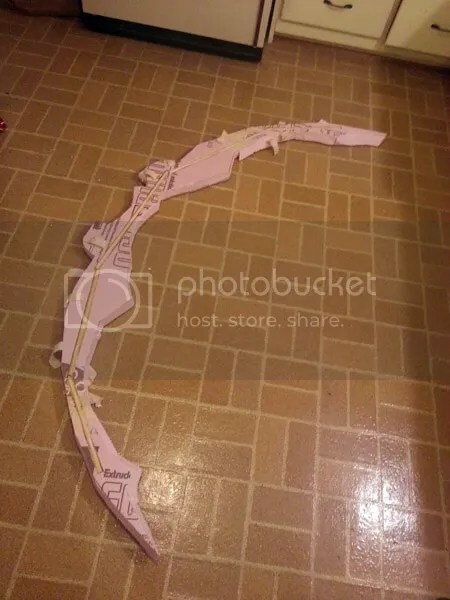 I was able to mark the smooth lines that follow the contour of the bow by taping a string along the bow in strategic places and then tracing the string. 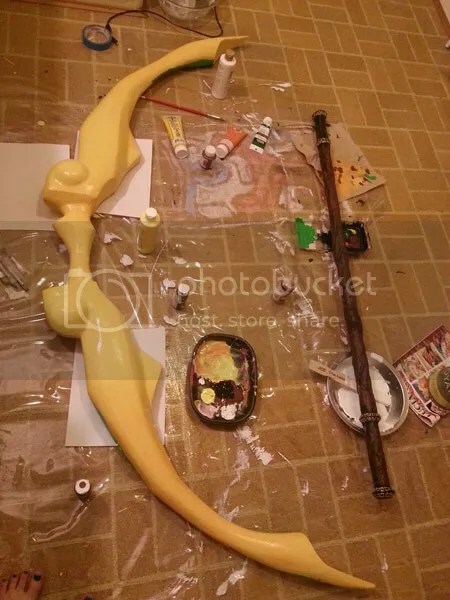 First goes the yellow acrylic base coat. Yellow is a little translucent to I could still see my pencil lines faintly through the paint. I painted everything with acrylics then sealed it with a glossy varnish. Afterward I wrapped the handle with some really soft, comfortable pleather that I distressed slightly. 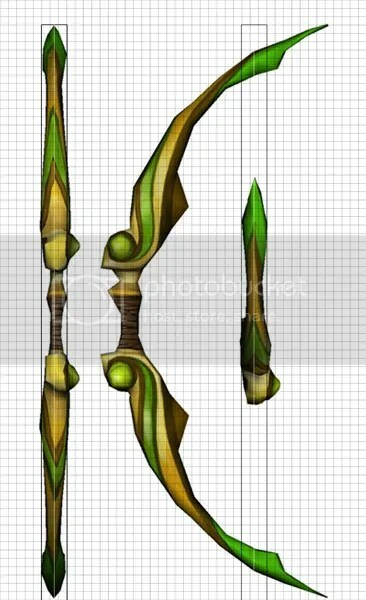 Below you can see the finished bow. I am a very small person so the bow looks huge in comparison. It was a much more reasonable size compared to the client! Special thanks to D. Davalos for help taking these photos.